Don’t miss our popular moose stew! Welcome to the restaurant at Älgens Hus. 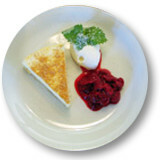 Here, we serve food to suit nearly all tastes and hunger levels in a unique environment. Enjoy the wonderful view over the Balberget hill – a part of the Ångermanbalen massif that in turn counts as a spur of the Stöttingfjället mountain. The restaurant is open for those who take a moose farm tour, but also to those who are just after some tasty food in pleasant company. Come try our game-inspired dinner menu. We also offer a children’s menu. Our café is always filled with sweet delights when you feel peckish. The summer menu is valid during our drop in opening hours. For other times of the year, bookings are required. Our popular buffet is served every day. At Älgens Hus, the moose are milked and the milk is made into moose cheese, which can often be found in the restaurant menu. Here, we offer anything from a simple but delicious moose stew to a fancy three-course meal. Are you considering a wedding, conference or other festivities, we would be happy to help you plan and arrange the event. Why not indulge in a festive meal in the restaurant, or under the trees in the woods? 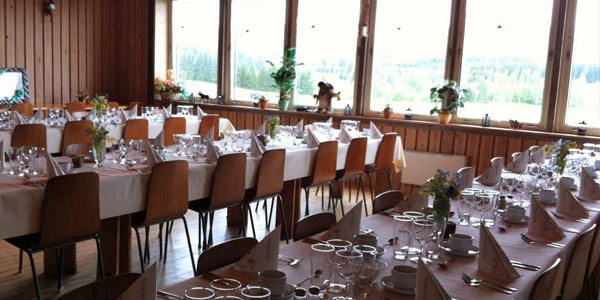 Welcome to book a table at Älgens Hus if you are planning a group event.